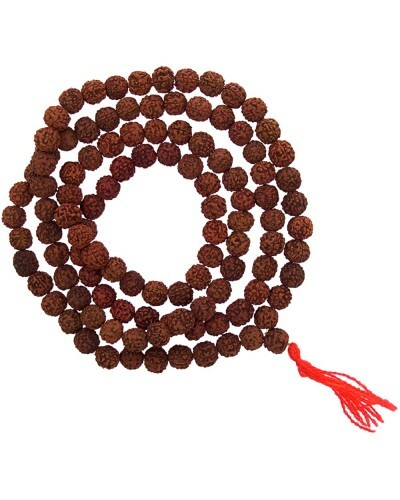 Rudraksha is a seed traditionally used for prayer beads in Hinduism, here in a strand of hand-strung mala with tassel. 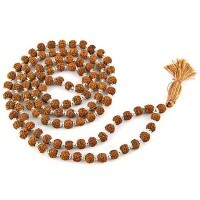 These Sacred Rudraksha beads are seeds from the Rudraksha tree with a tassel at the end of the Guru bead. 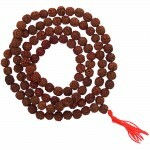 Rudraksha mala is perfect for meditating on Lord Shiva. The strand is about 48 inches long. A mala is a tool for meditation and prayer and is usually a string of 108 beads with one bead as the summit bead called a 'Sumeru'. 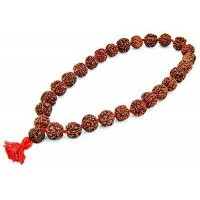 Malas are generally made from different materials such as tulsi (basil) wood, sandalwood, rudraksha seeds or crystal. Each type of material has certain properties which subtly affect the subconscious mind in meditation. 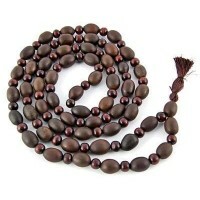 They are sometimes called Prayer beads and most likely is the origin of the Christian Rosary beads as well. 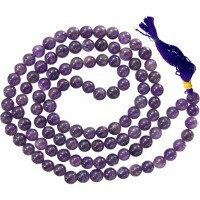 The mala beads are moved in rhythm with the breath and the mantra to help quiet and focus the mind during meditation. 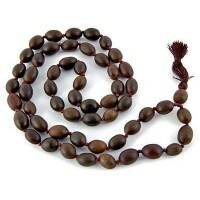 Over time, use and wearing, malas absorb the energy and vibrations for which it is used and often the simple of act of picking them up can slip the practitioner into a meditative state. The mala is traditionally held in the right hand and used in two ways - In one method, the mala is hanging between the thumb and the ring (third) finger. 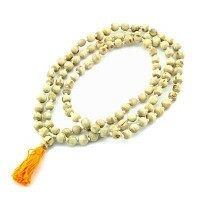 The middle (second) finger is used to rotate the mala by one bead towards oneself with each repetition of the mantra. In the other method, the mala is hanging on the middle finger, with the thumb used to rotate the mala just as explained - one bead at a time. Either way, the index finger is never used to touch the mala. Item Number: KK-98017 | Approximate Size (Inches): 4.00 wide x 1.00 deep x 5.00 high | Approximate Shipping Weight: 0.25 lbs.